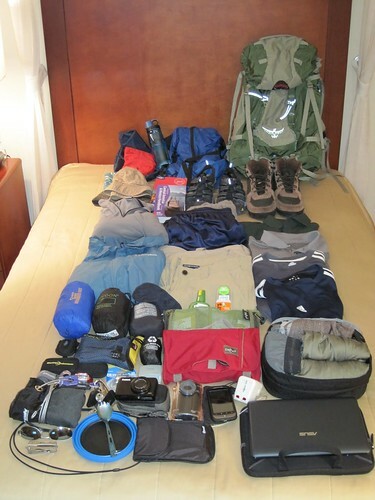 Deciding what to pack for a round-the-world trip is one of the most difficult steps required. With such limited space to pack all your worldly belongings, every item has to be scrutinized to ensure it’s truly necessary and not wasting space or weighing you down. We highly doubt we perfected this art straight out of the gates and expect to add and remove things over time as we figure out what works and what doesn’t. The most essential gear are the packs we’ll be carrying on our backs. Originally, we hoped these would be small enough to qualify under airlines’ carry-on requirements, allowing us to keep our packs close to us on planes and buses and avoid the nightmare of losing a pack. Unfortunately, we quickly realized packs fitting this qualification would be too ultra-light for us. Instead, we’ve opted for medium-sized packs, about 40-45 liter capacity, that comfortably hold everything we’ve decided to pack. Carrying a netbook, cell phone, iPod and other gadgets probably qualifies us as “flashpackers”. Regardless of the label, these devices help us stay in touch, keep us informed, and entertained. Since space is limited, we’re only able to pack a few days worth of clothes. That means we’ll be doing a lot of laundry (think: hand-washing) and looking for items that dry quickly and pack down tightly. Therefore, anything with cotton is pretty much out – especially jeans! Most of the clothing we’ve brought is of the athletic/performance/camping type. Zip-off “convertible” pants – it’s a pair of pants, it’s a pair of shorts, no wait, it’s Ex-Officio Amphi Pants! Pingback: Updated Gear Page – Explore Our Packs! I already have a very important question. Your picture and description about what you packed is great, however I am not sure how useful or enough some stuffs are. Thanks for helping us prepare! Hi Boca – glad we can be of some assistance as you plan your trip to Latin America! There are definitely some things that have been more useful than others. Without a doubt the best thing we have brought along has been the Pacsafe portable travel safe. I can’t imagine life without it! The Pacsafe gives us complete piece of mind when we have to leave valuable locked behind in a hostel, in a car, etc. I will email you so we can keep in touch with any other questions. So now that it has been 10 months.. i was wondering how living out of a backpack has treated you? Were they big enough or did you need more space? 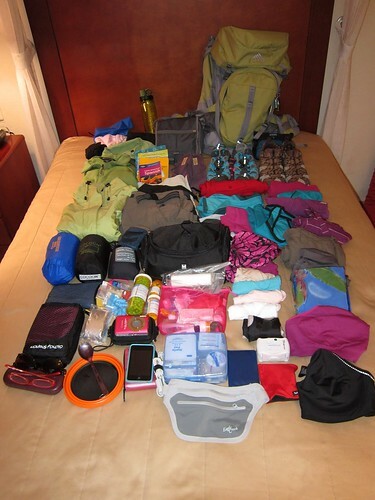 Have you used all the gear, overpack, or underpack? etc etc. What gear is priceless, what gear is useless? We backpacked Denali last year, and brough sooooo much ‘crap’ and that was only for a week. lol!!!! We’ve grown very used to living out of a backpack, and have been fine with the size of our packs and most of the things we have brought. Obviously, there are some annoyances, such as constantly having to pack/repack, wearing the same clothes over and over, and doing laundry all the time. Heather of course misses her shoes, dresses, and makeup! We’ll definitely do a post on what has been most/least useful soon. There has definitely been some crap we probably shouldn’t have brought as well! First of all I find this blog very useful, congratulations! My boyfriend and I are starting our 5 months trip around Asia in November and I am considering buying the Osprey Kestrel 48 for this trip. Can you tell me whether you are happy with this backpack and the mayor advantages/positive points and disadvantages/negative points that you have found? Hi Sonsoles – nice to hear from you! I would recommend the Osprey Kestrel 48. It’s a good size to carry a lot of things, but not so big that you will carry too much and kill your back. There is even quite a bit of space at the top that I generally don’t use and I often carry some items for Heather (such as her water bottle), so it can even fit more than is pictured here. I like the zippered compartments, in the top and on the sides. Unless we are trekking I don’t normally use the zippers on the waist belts, but that is useful sometimes too. The only thing that’s worn out on me after more than a year of travel was the included rain cover, which I use whenever we are in transit. Since it’s protecting the bag it is no surprise to me it wore out – I just bought a cheap replacement for it. If this pack fits you comfortably, I wouldn’t hesitate to buy it. Feel free to get in touch with any other questions and good luck preparing for your trip! Just bought the Kestrel 68 for my RTW trip in a month, I am worried for the top loading and the strength of the materials used, but it seems okay from what you said? have you had any trouble bringing your kestral 48l on as carry on? or have you been asked to check it often? Hey Erik, I cannot express how THRILLED Sprigs is to be included in your list of gear. Our Banjees Wrist Wallets are a great way to protect your valuables from pick-pockets. 2. We have additional Banjees – like our 2 pocket Phone Banjees (aka Big Banjees). Let me know if you want to take a look at one of our newer styles. Thanks, Andreas! I’ve updated the link and will drop you an email to follow up on your new products. Looks like you’ve really expanded your product line since we last checked! How did the kestral pack do on the small airlines such as Ryan air? I know they have strict policy for baggage size. Any info for small airline travel through Europe would be much appreciated regarding the Osprey Kestral 48 pack. Hey Brandon – thanks for stopping by. We didn’t travel in Europe, but I doubt the pack would break any size restrictions. We never had any issues with that.